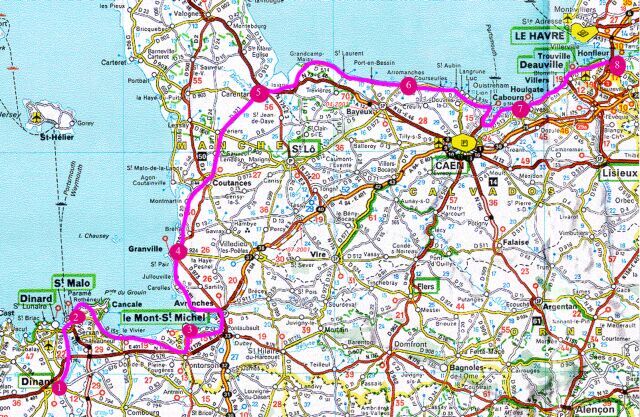 We had planned our biking trip to begin in Dinan, pass through St. Malo and Mont St. Michel, and then to go north to the invasion beaches of Normandy, ending finally in Honfleur. The terrain was promised to be gentle, and we chose to go from west to east so as to have the prevailing winds at our back. Len had made reservations at hotels along the way, and had found on the web a French bike shop that would deliver rental bikes at Dinan and then pick them up when we were finished in Honfleur. 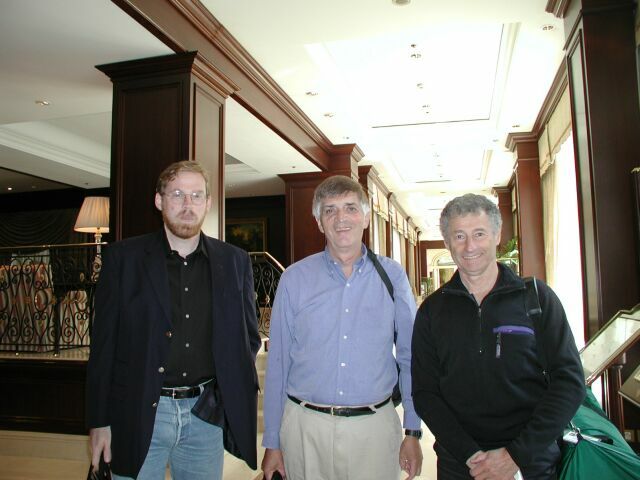 Everthing had been arranged when Len and I met for a conference in Brussels in July of 2002. Getting from Brussels to Dinan was worrisome. Our meeting didn't finish until 3:30pm, and we couldn't leave early -- Len was in charge of the conference and I was the last speaker. There was one possible train connection, and it was tight all around. It was going to be a close call in getting from our hotel in Brussels to the Gare Midi in time for the train to Paris. Then in Paris we had less than an hour to cross the city to a different station for the train to Rennes, where we would have another tight connection to the last train to Dinan. I didn't think it could be done. At the conclusion of the Brussels meeting three of us are ready to run out to our biking trips. Len, on the right, will be going with me to France, while Mike, on the left, is headed on his own to bike the southern beaches of Spain. Mike is a multi-talented professor at the MIT Media Lab, and has just had the thrill of winning the Van Cliburn piano competition. He's good, needless to say. Our cab arrives at the Brussels station, Gare Midi, in good time. This is going well, I think, as we board the fast train to Paris waiting there on the tracks. We have reserved seats in first class, but we can't seem to match our seat numbers with any on the train. We have to leave the train and find a conductor, who tells us that our seats are on a different section of the train, which hasn't yet arrived in Brussels, and is expected to be 15 minutes late. Now this isn't going well, and I begin to sweat. We'll never make the connection in Paris. The train eventually does leave Brussels about 15 minutes behind schedule, and I sit back and relax. There's nothing I can do now; I'm in the hands of the train, for better or worse. The crunch will come when we reach Paris. I'm trying to think of what plan B will be when we miss the only train that could get us to our reservation in Dinan that evening. Try as I might, there is no plan B. I put this thinking aside as the conductor comes through with dinner, which is a tiny sandwich with a glass of red wine. Before I'm ready for the crunch, we're pulling into Gare du Nord in Paris, still 15 minutes behind schedule. Len and I had been debating the best way to cross Paris from Gare du Nord to Gare Montparnasse. We had even consulted with some of our French friends at the meeting in Brussels. Should we take the Paris Metro or a cab? It was rush hour, and I had counted the stops on the Metro -- there were 13 stops between the two stations. The betting was that the subway would be faster, and a friend had even given me two subway tickets to save us the time of buying them. As we run to the subway station, I warn Len once again about my experience a few months earlier in trying to get through the subway turnstiles with a suitcase. Twice during that trip I had had my suitcase jammed in the turnstile and my ticket voided. So this time Len and I are very careful in carrying our duffel bags through the turnstyles. And there is no problem -- or so I think. We run frantically, following the many signs to Metro 4, but they seem to be leading us in circles. Finally, the signs to Number 4 point back out through the turnstyles. It seems that we have to leave and re-enter in order to get to the right subway. Ah, but now we discover what we really should have worried about at those first turnstyles. We had forgotten to retrieve our tickets as we passed through! And now the turnstyles won't let us out of the subway so we can come back in again! This is like something out of Kafka. I feel like sitting down and giving up, but Len runs over to a booth to ask for help. Of course, there are people there in line. After what seems like an endless delay, an employee lets us out of a special gate, and we go over to a machine to buy new tickets. I've really given up on the possibility of making our train as we head back through the turnstyles once again, this time being sure to retrieve our tickets. (Of course, we never needed them again.) When we finally arrive at the platform, the right subway has just pulled up, and we jump on. I count the stations as we stop to unload and load. One, two, three,... The subway is really making good time, and I'm amazed to arive at the Montparnasse stop with still five minutes left before our train is to depart. We begin running once again, and face another decision. A Paris friend has told me that it is better to go up to the street and head for the tallest building, rather than follow the signs in the subway tunnels towards the train station. But the fear of getting disoriented or lost out on the streets is too much, and we run along the longer route through the subway connecting tunnels. Well, unbelievably, against all odds, we make the train to Rennes. We find an unoccupied compartment, and I collapse into a seat. I'm sweaty, but happy. Somehow, we're going to get to Dinan after all. I watch the passing countryside and feel elated. This is always the best part of the trip -- the expectation and anticipation of the freedom and adventure to come. The rest of the trip will be an anti-climax. The train station in Rennes is cavernous and empty at this hour. We go up and down several escalators looking for a ticket booth, and eventually get in a small line to buy tickets to Dinan. I see our train listed on the board, and we are in good time. When we do buy the tickets, we are told that the train to Dinan is actually a bus, and we have to go outside to board it. This is strange, but no big deal, but first we need to look for a bathroom. On the way we see two beautiful young girls kissing passionately. Wow! But the bathroom is closed, and someone tells us that the only other bathroom is in a bar at the other end of the station. So we go there, and discover a sign that says that the bathroom is for patrons only. Len says that we should disregard the sign, and as he heads for the bathroom a burly bartender blocks his path. "Only for patrons," he says in French, I think. For an instant he and Len confront each other, but then Len wisely backs off, and we go outside looking for the bus and a bathroom. We find the first, but not the second. Len asks the bus driver, a woman, if there is a bathroom on board, or if she knows where one is. No, and no. So there is nothing for it but to grin and bear it as the bus heads out of town in the quiet darkness with about five people aboard. Oh, the small innumerable discomforts of travel! It's about 11:00pm when the bus pulls up outside what is presumably a train station in Dinan. We ask, but the bus driver doesn't know where our hotel is, so we begin walking the deserted streets back in the direction from which the bus has come. We ask several more people, but no one knows where our hotel is, and eventually an older man makes motions that we are to follow him. 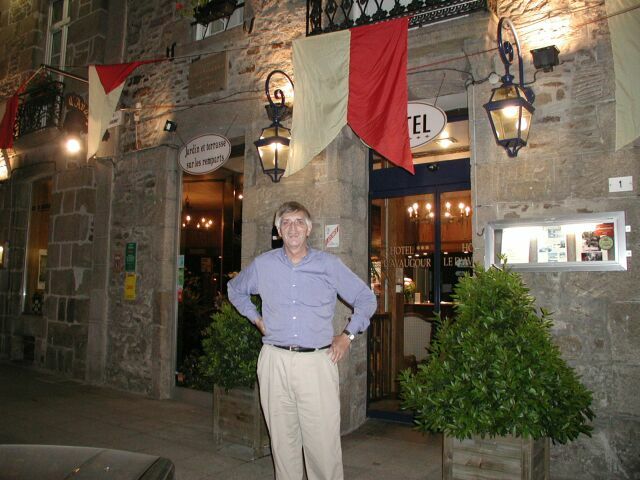 He leads us to our hotel, and here I am standing outside its entrance that evening. I'm looking happy to have arrived.